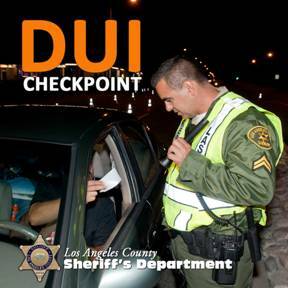 PALMDALE – The Los Angeles County Sheriff’s Department’s Traffic Services Detail will be conducting a DUI/driver’s license checkpoint at an undisclosed location in Palmdale this Friday, July 20, between the hours of 6 p.m. and 2 a.m., authorities announced. 8 comments for "DUI checkpoint in Palmdale this Friday"
I hope my very good buddy Drew Mercy stays home so I won’t worry. Things are so bad here in Southern California, they police it as though it’s Tijuana. Pulling us over without due cause, our policemen are more like Mexican federalis, than America’s finest. May as well go right ahead, call it what it is, change the state name to Mexifornia. Don’t drink and Drive. Don’t drive without a D.L. Not to hard to follow simple rules. The Law the Law. At 7:00 am at stater bros. Market. Cops just doing their job. Keeping drunks off the road. Thank You AV Sheriff. Keep the streets safe. Two most corrupt bureaucracies in California, LAPD & LASD, to them our Founding Father’s constitution is best used, as toilet paper.